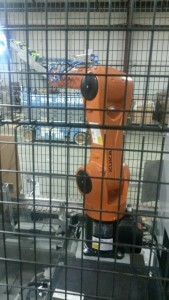 A new robot has been added to the Cox Container Industrial Round Gallon Line. This automation positions Cox Container to efficiently package Industrial Round Gallon bottles in either a 4 or 6 pack configuration. A vote by the staff named our new robot “Herbie”. We welcome Herbie to the Cox Container team and look forward to many more improvements in the future. Your plastic gallon containers are very sturdy.